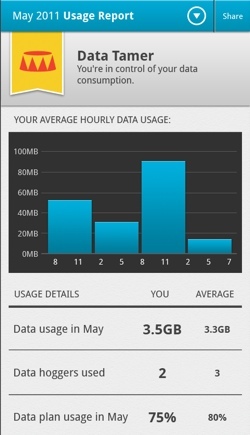 Onavo is a startup dedicated to shrinking mobile data bills. While its Android app doesn’t yet literally reduce your data bill like the iPhone version, it’s just been upgraded with some exclusive new features that should help you save data and make the most of your apps. Onavo has been collecting data about how users of its Android app use data on their devices, and now it’s letting users access that information themselves. 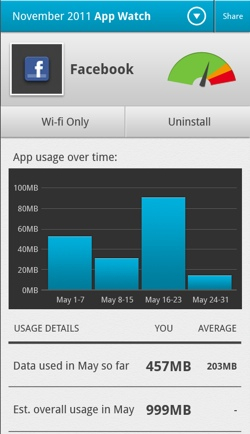 For each app you use on your device, Onavo will now show your data usage compared to other users. It will also display how many users restricted the app to Wi-Fi and how many users uninstalled it altogether. There’s also an ‘Onavo meter’ – a visual display of how heavy the data demands of any particular app are. The app also tracks your overall data usage per day, week and month compared to other Onavo users; highlight any apps you should be careful with, and badges that show how much of your data plan you’ve used. The differences in the way iOS and Android handles data means that it’s more challenging for Onavo to add its data compression technology into the Android version. However, today’s new features aren’t yet available on the iPhone and help add value to the app – and maybe your data plan too.